If you’re new to gratins, they may become a good friend; especially in August, when there are so many gratin-friendly vegetables in season. And if you’re the type of cook who doesn’t like following recipes to the letter, bingo, because tomatoes (any variety), zucchini, eggplant, onions, leeks, fresh herbs and potatoes — all are wonderful mixed and matched in gratins. The word “gratin” actually refers to a recipe, usually made in a shallow baking dish, which is covered in a golden brown crust. If you are in possession of a gratin dish (Tian), you’re good to go. However any shallow, 2-quart oven-safe dish makes a lovely gratin. My gratin dish is missing in action, so I use a shallow, oval lid that tops a glass casserole, and it worked quite well. Here’s a couple of other recipes for easy off-the-farm gratins that can be made in minutes. One uses pattypan squash, leeks and tomatoes and is a bit more involved, the other is a simple tomato gratin, similar to the recipe below. Preheat oven to 375 degrees, and arrange oven rack on top shelf. 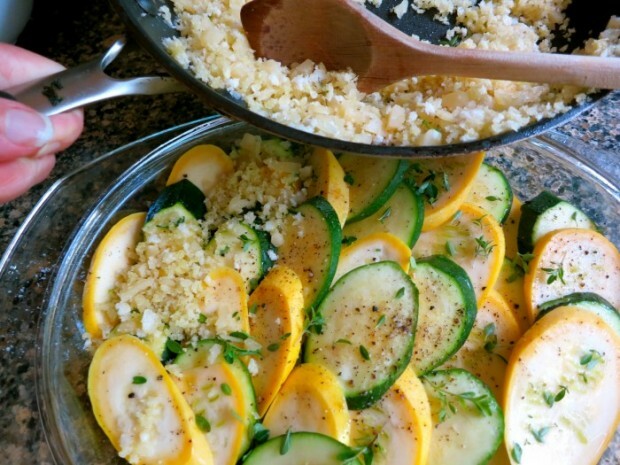 Layer zucchini and squash slices in an oiled 9×13-inch glass or ceramic baking dish. Pour 3 tablespoons water into dish. Lightly season with kosher salt and freshly ground pepper. Sprinkle thyme over vegetables. In a small sauté pan, heat oil over low heat. Add garlic and sauté until fragrant, about 2 minutes. Remove from heat and stir in panko or bread crumbs and Parmesan. 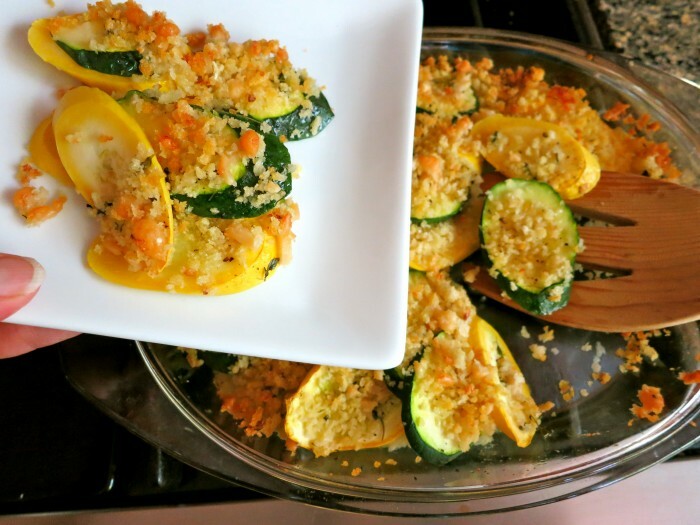 Sprinkle seasoned panko or bread crumbs over zucchini and squash. Bake 15-20 minutes, or until top is golden brown.